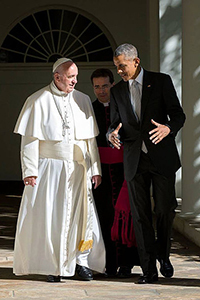 As Pope Francis does, he caused a great stir in his visit to the United States. It was certainly felt here at Moreau Seminary as I saw many of the seminarians take time out of their busy schedules to watch the pope's various speeches and read much news analysis of everything he was doing. It was easy to see in each place he visited the sea of people with their iPhones ready to get a close up picture of the Supreme Pontiff. This certainly has not been the first time a pope has visited our countrypossibly you may remember the visits of John Paul II and Benedict. Yet there seems to be a different buzz that surrounded this visit. Why is that so? What's different this time? 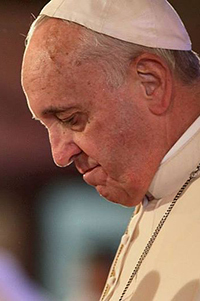 Since his election in 2013, Pope Francis has been raising eyebrows. Certainly, what he is saying is not different than other popes have said (although people are paying more attention to him for sure!) I think what's catching people's attention is what he is doing. Not only is he talking the talk, but he is walking the walk, doing things that are catching people's attention. Just look at what he did while here in the UShe spoke to Congress and the United Nations, served the poor in Catholic Charities, assisted the World Meeting of Families and visited a grade school, among other things. In other words, the pope has been inserting himself, or rather, the Church, into many of the affairs that our country is dealing with. More so than we have seen from popes recently, Francis is making his stance known on many hot-button issues. He mentioned environmental issues, talked about immigaration, exhorted human rights, spoke out against abortion and the death penalty and urged American citizens to see themselves as part of the global society. Many critics do not like how he is inserting himself into conversations of which he is not an expert, but I believe that Francis is not just trying to put in his two-cents about what is happening in our country. He, as head of the Church, is trying to inform these issues from the Church's perspective. He is urging us to look at them differently and not necessarily divide them from our religious lives. These things are not just only political issues, but they are moral, spiritual, ecclesial issues. They touch upon the very substance of our lives and they require a fuller perspective to be taken on them, a perspective informed by faith. I am sure that the Holy Father knows that politicians will not approach these issues with such a lens, but we as Christians can and should. And I think that's the point. Francis is inciting us Christians to look at these issues in light of faith and that they are ones we need to think about, engage and inform from our Christian perspective. The world is not separated from faith, but should be infused with it and we Christians can make that happen. Even as he gets involved in the big issues of our day, he still remembers the "lesser ones among us." His visits to Catholic Charities and Our Lady Queen of Angels grade school in particular remind us to keep the poor and disadvantaged close to our hearts, as he has done since the beginning of his pontificate. 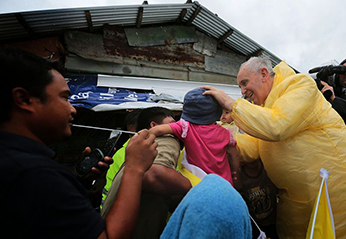 Even as we allow our beliefs and faith to inform the issues of our world, Pope Francis still reminds us to keep an eye open to those who often go unseen, to actually do something in the immediate world in which we live to relieve the sufferings of those who hurt. If we work to bring faith into the pressing issues of our time, yet do nothing in order to implement that faith in our daily tasks, then we only end up being hypocrites. Francis is calling us to talk the talk and walk the walk as Christians, for that is the true witness that we can give to the world. Hence, I think that is why so many are attracted to himhe is giving us a living witness and he is calling us to follow his lead. I know that I speak for us all at Moreau Seminary that we have been influenced greatly by the visit of Pope Francis and his actions and example. We strive to put into practice what he has been showing us to do, for he has exemplified how such a witness has influenced so many. We continue on our journey as Chriatian witnesses in this world and long to insert Christianity into the world's issues and stay rooted in helping the less fortunate. As Guadium et Spes so beautifully points out, "The joys and the hopes, the griefs and the anxieties of the people of this age, especially those who are poor or in any way afflicted, these are the joys and hopes, the griefs and anxieties of the followers of Christ" (1.1). May we take as our own these joys and sorrows of our world, and with the example of Pope Francis, infuse hope into them and so be a witness that we do not walk apart from the rest, but right alongside with them. Mr. Ryan Pietrocarlo, C.S.C., is currently in his fourth year oftemporary vows, and lives at Moreau Seminary with his fellow seminarians and scholastics. Ryan graduated from Notre Dame with an undergraduate degree in biochemistry prior to entering into formation with Holy Cross. He is originally from East Rochester, New York.